Big Ben (on the far right side of the photo) is the world's most famous and recognizable clock. It has become the icon of London. This timepiece is part of the large building that houses the legislative body of the United Kingdom. It's a Neo Gothic architectural gem. Officially, Big Ben refers just to the massive bell that clangs the hour. Some people even use the term to define the entire clock tower (bell and all). See "Renaming" section below. Although the second definition is unofficial, only a purist would object to someone using it. The clock tower (but not the clock) was officially renamed "Elizabeth Tower" in 2012 to celebrate Queen Elizabeth's 50th anniversary as the monarch. Controversy: Some Brits liked the renaming. 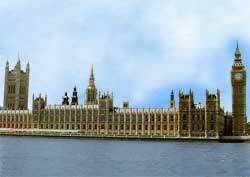 Others hated it (not the queen) - and will continue to call their endearing clock tower "Big Ben." Because of the widespread popularity of the moniker "Big Ben" in England and internationally, I will use the old name in my website until the new one gains sufficient traction.